If you are looking for an energy-efficient roofing solution for your commercial building, look no further than TPO roofs! TPO is a modified rubber roofing material. Like the other commercial roofs we offer, it is durable and long-lasting, with the average lifespan of 20 years or more! Energy efficiency sets this flat roofing material apart from others that are otherwise similar, including EPDM and modified bitumen. Not only does it save businesses money on energy bills, but it is also a recyclable roofing option! For over 15 years, our roofing contractors have kept up with all the latest roofing materials and techniques. 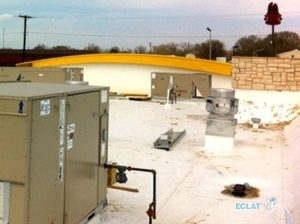 We install Dallas, TX TPO roofs with professional expertise and care, so you will know you’re getting the best commercial roofing service from Eclat Roofing! Call us today at (214) 373-1500 for your TPO roofing service. TPO is a flexible material, which makes it more resistant to damage (and therefore needs fewer repairs) than other commercial roofing systems. However, most roofs occasionally need minor repairs, especially after the strong storms we experience in the DFW area. We can repair your roof quickly and effectively to help it last! Especially after a storm, it is always a good idea to schedule routine maintenance of Dallas, TX TPO roofs. We tend to experience severe storms, hail, and sometimes even tornadoes around the North Texas area, which makes it vital to the life of your roof that you make sure there is no damage after storms. Otherwise, you may find yourself in need of a commercial roof replacement. Maintaining your TPO roof will also ensure that it is working its hardest to reduce your air conditioning costs during the hot Texas summers! TPO roofs are installed in two layers: one layer of insulation (which is the secret to those energy costs) and one layer of a usually white TPO sheet that reflects UV rays and protects the roof from damage. Since these roofs last decades, installing a TPO roof is a fantastic investment for a commercial property, since you will see energy savings and minimal damage to your roof over the span of its life as long as you maintain it properly. If you are interested in Dallas, TX TPO roofs, call Eclat Roofing today at (214) 373-1500! Our roofers have experience working with a variety of roofing materials for over 15 years. Updated on September 13, 2018 at 3:17 pm by Eclat Roofing.